My friend, Larry Kinder, who lives in Waco, Texas, is an avid gardener and landscaper. Larry’s gardening activities were severely hampered last year by his area’s worst drought in over half a century. He decided to install a rainwater storage system to help with the problem. I decided to interview Larry about his experiences and offered to share it here on Greenspiration Home. 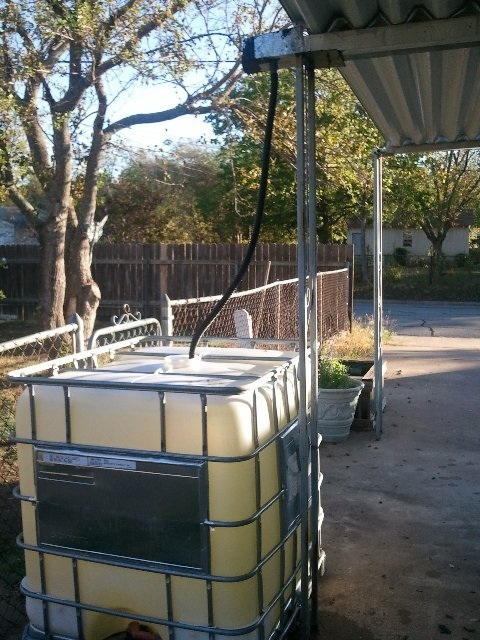 Hopefully Larry’s experience will give you a “leg up” on your own rainwater storage endeavors! Brad: Larry, you had a very hot, dry summer last year in Texas…how did that impact your personal home water usage and consumption? Larry: Actually I stopped watering altogether. I didn’t have my rainwater system in place for last winter’s rainfall. My idea was to see what survived. These survivors will be drought-tolerant plants, which I’ll use in my landscape. Brad: What gave you the idea to build your water storage system? Larry: Seeing all the “wasted” rainwater flowing off my carport roof—storms turn it into a mini Niagara Falls. Brad: How have your neighbors reacted to the system? Larry: If I don’t show it to folks, they don’t even know it’s there. Brad: OK, so how did you construct your storage system?